Late November saw me returning to the North Kent coast to finish my walk along the Wantsum Walk. 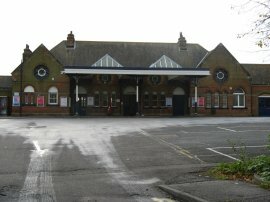 I drove down from Walthamstow and parked at Birchington on Sea station before taking the train for the 9 minute ride to Herne Bay to rejoin the route of the Wantsum Walk. A single ticket cost £2.50, with the return being only 10p more! From Herne Bay I followed the coast to Reculver which completed the coast part of the Wantsum Walk, and from Reculver I then walked the final inland loop of the walk to complete the entire walk. 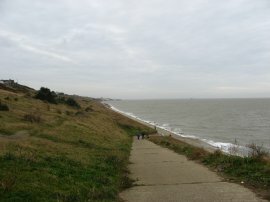 The first part of the walk to Reculver follows the route of the Saxon Shore Way which I had walked back in July 2006 in slightly sunnier and warmer weather. 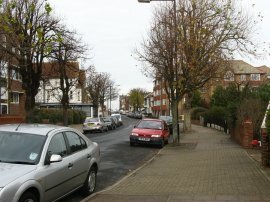 From Herne Bay station, photo 1, I headed down Station Road, photo 2, to reach the seafront, opposite the pier, photo 3. Once again I had reached the coast at high tide and the sea was completely covering the beach. 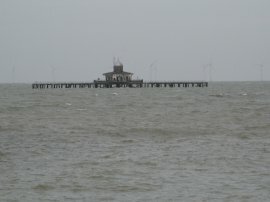 Further out at sea I could see the remains of the end of the old pier, photo 4, still standing isolated from the shore. At 1147mts this was once the second longest pier in the country but the end of the pier was closed in 1968 and the head has been isolated out at sea since a storm destroyed the majority of the pier in 1978. From the pier I turned to my right and headed along the sea front, photo 5, passing through the enclosed bandstand, which has some public toilets and on past the clock tower, photo 6. 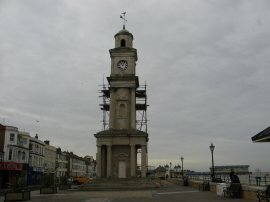 The clock tower was built in 1837 and is 23 meters tall. 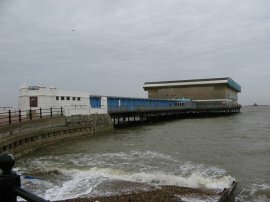 The route continues along the East Cliff Promenade, photo 7, heading out past Herne Bay sailing club and a coastal lookout station. 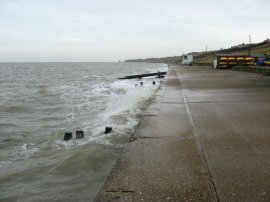 With the high tide being accompanied by a very strong wind, which fortunately was more or less behind me, the waves were splashing up onto the promenade in a number of places and much of the broad concrete path that runs along the sea front was covered in patches of shingle that had been washed up from the beach. 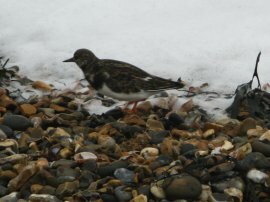 All along the shoreline Turnstones were nimbly running about the edge of the waves, photo 8. Nearing the end of the promenade, as the cliffs at Bishopstone start rising above the beach, the route heads up a concrete path to a car park at the cliff top. 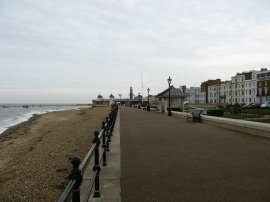 Photo 9 was taken looking back down the path towards Herne Bay. 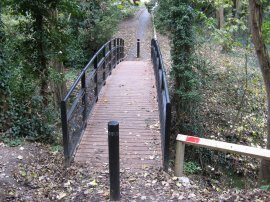 A tarmac path runs from the top of car park, heading down to cross a newly built wooden bridge, photo 10, over the top of Bishopstone Glen. The path then turns to the left and runs alongside the back of some house with the glen on the left, before passing through a patch of small trees. Leaving the trees the route joins a narrow concrete path running just above the cliff top which heads up to another car park on the edge of the Reculver Country Park. The Country Park covers 37 hectares of meadows and grassland and part of the area is a Local Nature Reserve and much of it is a Site of Special Scientific Interest. By the car park there was a group of people flying model gliders in the wind that was blowing up the cliff which was quite interesting to watch. 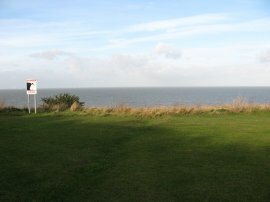 From the cliff top there were good views over the Wantsum Channel towards the Isle of Thanet, photo 11, and Birchington on Sea which would be my final destination for the day. 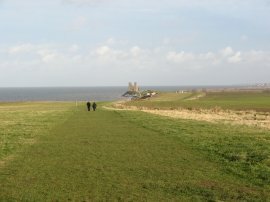 Leaving the car park the route follows a broad grassy path through the country park, gradually heading down hill towards the twin towers of Reculver Church, photo 12, where I completed the coastal stretch of the Wantsum Walk. Unlike when I had walked the second part of the Wantsum Walk, this time the Interpretation Centre was open when I reached Reculver and as well as being able to read about the history of the area I was able to buy the guide notes produced for the Wantsum Walk by Kent County Council. The notes are split into three leaflets, one for the coastal strip between Birchington and Herne Bay and one each for the two sets of loops that head out from Reculver, which were lettered A-G in the guides and were well worth the £1.50 price tag. Looking at the leaflets I saw that I now just had loop A to complete. 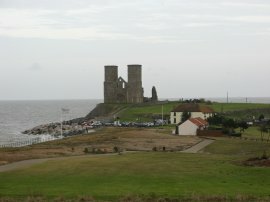 From Reculver, photo 13, I turned inland, following the route of the Wantsum Walk that I had taken at the start of day two of my walk, heading past a caravan park and over open fields to reach some railway lines. Here the route joins a concrete farm track which passes under the railway lines and heads up to Brook Lane. The route then turns right to head gently back downhill to cross back over the railway lines at Brook Bridge. Just past the bridge the route of the Wantsum Walk then turns left along a driveway opposite the barns of Brook Farm, photo 14. Reaching a house the route bears right to reach a junction in the path. Last time I had turned left at the junction to cross back over the railway lines but this time I turned right to cross a wooden bridge over a small stream which leads out into a large open field. Heading across the field the route heads towards a prominent church that can be seen on the horizon. 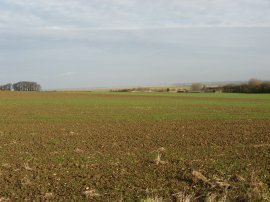 Although recently ploughed it was nice to see that the route of the footpath, photo 15, had been marked across the field. As I was walking across the field the sun suddenly appeared brightening up the landscape considerably, photo 16. 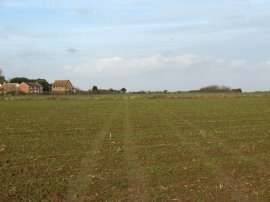 Having crossed the field the route reaches a road besides the church of St Mary the Virgin at Reculver, photo 17. 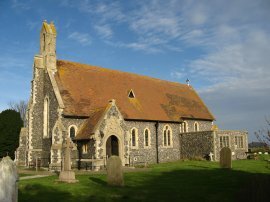 This was a particularly attractive church which had commanding views across the Wantsum Channel from the churchyard. 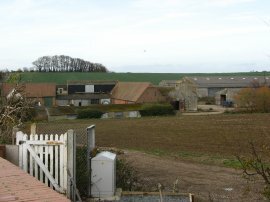 The route then continues along Reculver Lane to the junction with Reculver Road where the Wantsum Way takes a footpath off to the right that runs out over the middle of another field, photo 18. 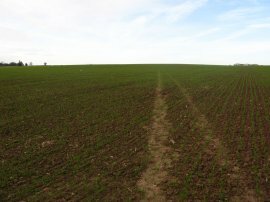 This footpath heads over a couple of fields to reach the car park at the start of the Reculver Country Park which I had passed through earlier on in the day on my way along the coast from Herne Bay to Reculver. Once again a clear path had been marked through the field making navigation easy. Having reached the car park meant that I had now completed all the sections of the Wantsum Walk. 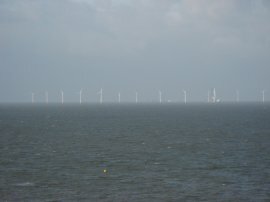 Out at sea ahead of me I could see the windmills of the Kentish Flats Offshore wind farm, photo 19 and photo 20 was taken at the spot where the two sections of path link up. Having completed this loop the distance I had walked along the Wantsum Walk today from Herne Bay was 6.87 miles. 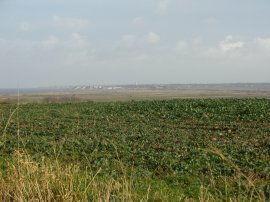 From the car park I then made my way back over the broad grassy path through the country park to the Reculver Church where I started my walk along the Thanet Coast path which runs between Reculver and Pegwell Bay.